At Sandman’s our focus is to give you more options and great service on your Asphalt or Concrete job. 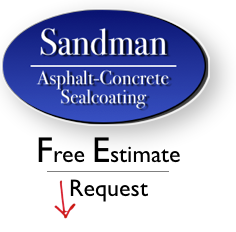 Sandman is also one of the few Paving companies that also does Concrete Driveways. The Sandman’s team is experienced to bring commercial property owners and managers comprehensive Parking Lot maintenance programs and cost effective Parking lot repair systems as well. We’ve been working with local business owners and property managers for many years. For a quick quote just fill out the form on the right side of this page or give us a call at 847-836-6071. We are here to answer your questions about our paving services and your asphalt surface. You have definitely found the correct Algonquin paving company! We look forward to speaking to you soon.